AUSTIN — Late Sunday night, 10 days before classes were scheduled to start, workers at the University of Texas at Austin began removing three Confederate statues from a prominent grass mall on campus. The surprise news came with little notice, and the workers were done by sunrise. University president Greg Fenves announced that the statues of Robert E. Lee, Albert Sidney Johnston and John Reagan were being removed because they depict parts of American history that “run counter to the university’s core values.” His e-mail to the campus community was sent just before 11 p.m. A statue of former Texas Gov. James Stephen Hogg was also marked for removal. 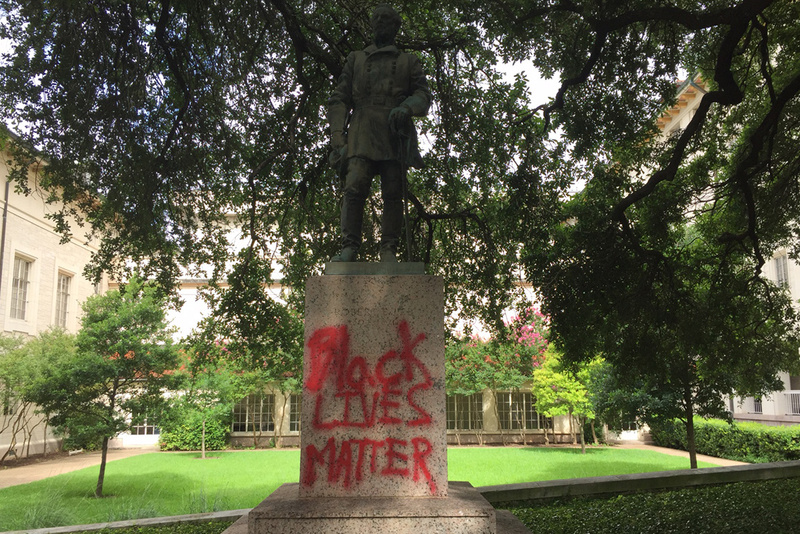 The decisions at UH and UT-Austin happened about a week after unrest in Charlottesville, Virginia surrounding the removal of Confederate statues in that college town. Neo-Nazis and white supremacists protested those statues’ removal, and clashed violently with counter-protesters. One person died in the violence. “These events make it clear, now more than ever, that Confederate monuments have become symbols of modern white supremacy and neo-Nazism,” he said. The three Confederate statues will be relocated to the Briscoe Center for American History. The statue of Hogg “will be considered for re-installation at another campus site,” Fenves said.